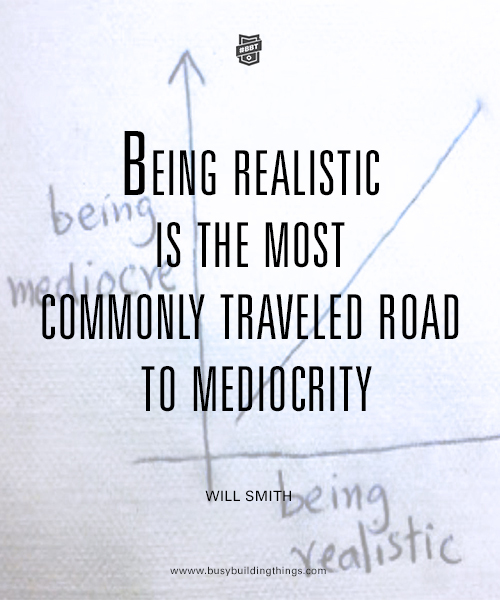 Being realistic encourages mediocrity. Mediocrity is an average – and nothing new, inspiring or innovative comes from what already is. There are far too many people that lower their personal expectations because they choose to think ‘realistically’. Now, don’t get me wrong, all things take time and I don’t believe in irrational thinking. You cannot turn an idea into a business overnight. Success takes time. However, if you can’t even envisage a bigger picture… then how can you expect it to ever happen? 1. The only constant in life is change. The issue that you’re facing right now won’t last forever. 2. Reality is generated from thought. If you have an idea there is a possibility that it can happen – but that won’t happen if you’re constantly clouded by doubt. Doubt is THE biggest dream killer. 3. Have you ever realised that the most successful people are the most unlikely? 4. Unrealistic goals often stem from our inner thoughts, desires and passions. Add determination to the mix and that is a combination that can steer you towards success. You have to be willing to commit. Remember, the only person who can put a ceiling on your capabilities is yourself. So stop striving for a ‘realistic’ goal and challenge yourself. Because nobody really wants to be mediocre. This is one of my biggest downfalls – I’m too realistic. Luckily my husband helps me strive and push for my dreams! We all struggle with this sometimes! I’m glad that you have someone to encourage you – keep pushing for it!